His hard work at Ush Records caught the attention of the extremely prominent producer, Sean Garrett, who tapped Miles to be his personal engineer. With Garrett, Miles garnered his first number one hit “Break Up” by Mario. 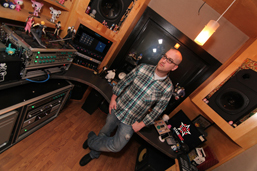 Continuing his reign with Garrett throughout the late 2000’s, he engineered the number one hit single by Beyonce, “Diva,” as well as multiple smashes by the Pussycat Dolls, Britney Spears, Enrique Iglesias, Amerie, and Jesse McCartney.